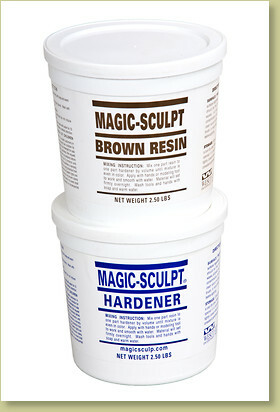 Two-part epoxy putty specifically designed to meet the needs of modelers, crafters and sculptors. We use Magic Sculpt primarily when working with replicas, but also in the restoration of original fossils. It has a fairly lengthy working time, smooths out with water, and takes texturing well. No shrinking or cracking. It can be shaped by hand or with modeling tools, sanded, carved, and painted. You can attack it with a grinding tool and the cured material will not break apart or lose its shape. Cures at room temperature. The brown color closely matches much of the fossil and replica material we work with and we use many, many 20 pound kits of this. White can be used as is, or carefully blending a variety of cement colors with it, will yield just about any color you need to achieve. Natural is good for those who want to create their own color from scratch. Notes Your choice of white, brown, or natural color when cured.